Just how big can a raised bed garden box be? In our family, that question isn’t nearly as rhetorical as you might think. We’re up to a six hundred square feet of raised bed garden space… And planning for another 1,000. Not terribly long ago, I promised to share my guide on how to build your own raised bed garden boxes. As you might imagine, I had to make some adjustments to bring it down to size for the average reader. Last year my friend, who is an amazing gardener, invited me over to check out his garden and ask any questions I had. What an awesome opportunity! Something he showed me, that he was incredibly proud of, were his garden boxes. He told me that if he knew how great they were, he would have spent the money and built them 20 years ago! That got me thinking, “I don’t want to be in the same boat.” So, I started creating plans and working out the cost. Everything I came up with was just too expensive. I wanted two foot deep boxes that were four feet wide and fifty feet long. You can imagine how expensive an all wood garden box would be. That’s when my wife thought of the idea of using corrugated roofing for the sides. We were concerned about the possible effects the metal might have on the dirt with prolonged contact. We looked into it and it turns out that it isn’t an issue at all! The cost of 50′ boxes? Time to look into materials. After my wife finished creating the garden box designs the price came out significantly less than any design I had been thinking of. Each 2’x4’x50′ box would cost $280, plus the cost of dirt to fill it. That’s 200 square feet of gardening space! So we built three of them! I realize that most of you aren’t looking for a fifty-foot garden box, so I’ll give you a materials list for an eight-foot box later in this post. Buying all the goods at your local hardware store, except for the fill dirt, you’re looking at around $80. Add $40 for some nice garden soil and for around $120 you’re set to garden! 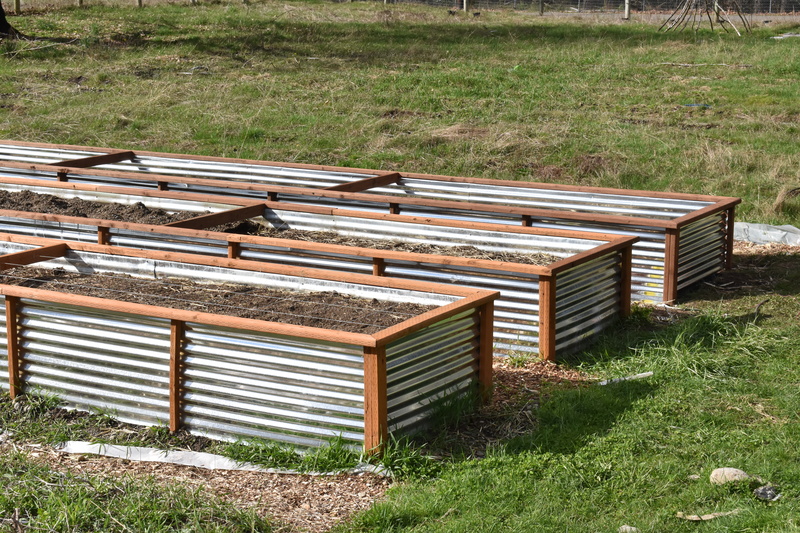 Why build your own raised bed garden boxes? Before I give you the material list, here are a few of the major reasons to build your own raised boxes, including the weed prevention, rock dodging, back and knee protection, and swampy soil avoidance. First, one of the biggest attractions for me is that the weeds from the walkway won’t be able to get into my garden! Of course, there will still be some weeds to deal with, but the barrage of weeds will be incredibly reduced. Secondly, in Roy, Washington, at least, the ground is 50/50 soil/rocks, and the rock sizes range from the size of my fist to as big as my head! We brought in garden mix soil to fill our garden boxes. Now my garden area will not have fist sized rocks everywhere I try to plant. Also, having 2′ tall boxes makes reaching across them really easy; which makes it easier on your back and knees! Finally, if your garden area resembles a swamp area during the winter, like a lot of areas around me, then raising your planting area will mean you can fix the drainage of your planting area. You won’t have to wait for the summer sun to dry up the ground before you can work the soil. Cut the 2"x4"x12' board into 4 x 3' long sections. Create a 30 degree angled point at one end of each 2"x4"x3' board and 2"x2"x3' post with a miter saw. Pound in the 4 2"x2"x3' corner posts so that two feet are above ground eight feet apart from the outer edges of the posts on the long side, and four feet apart from the inside edges of the short side. You can use a fence post driver, or a sledge-hammer, to pound in the posts. Attach string from corner post to corner post on the long sides. This string will help you keep on track as you pound posts along the wall. Four feet between each corner post on the long side, pound a 2"x2"x3' post so that two feet are left above ground. On the outside edge (lengthwise) of each corner post, pound a 2"x4"x3' post with the outside edges flush with each other. Screw the corner posts and boards together with 2 4" deck screws. Place 1 26"x8' corrugated roofing panel on each of the eight foot long sides of the box, with approximately two inches of the panel sticking up above the pounded in posts. Screw in the panel with three 1 1/2" screws into each post, in the top, middle, and bottom valleys of the panel. Use tin snips to cut the remaining panel into two 3'10" sections. Screw in each 3'10" end cap with three 1 1/2" screws on each side, the same as the side panels, with 2 inches of each panel sticking up above the top of the posts. Cut one of the 2"x4"x10'. At a 45 degree angle, miter the outside edge of the board, then miter the other edge so the inside length would be 4'. Cut the other half of that same board to match the cuts you just made on the first board. As you place the end-cap railing, fold the roofing panel that is stickingup over the post and under the railing. Then screw down each side with a 4" deck screw. For each side railing, measure and cut to fit the remaining 2"x4"s. Miter both ends to match the already placed end railings. Screw down at each end and into middle support post with 4" deck screws, making sure you folded under the railing the portion of the side panel that was above the support posts. Fill with the dirt of your choice. Plant vegetables and enjoy your new and fabulous garden box! Folding over the roofing panel gives more support to the railing, so you can lean on it with more weight and not worry about warping the board or tearing out any screws. There you have it. Use these raised bed garden box plans and instructions, and you will have yourself a mighty fine raised bed garden that you’ll be proud to say you built yourself. Here, on this homestead, one 8′ box just wouldn’t be enough, so as mentioned we ramped it up and built three 50′ long monsters. Our eventual goal is to have 13 of them! Making a longer box is a little different than an 8′ box, so if you would like a bigger box, please let me know. I can confidently modify these plans to match any needed size and answer any questions you might have. 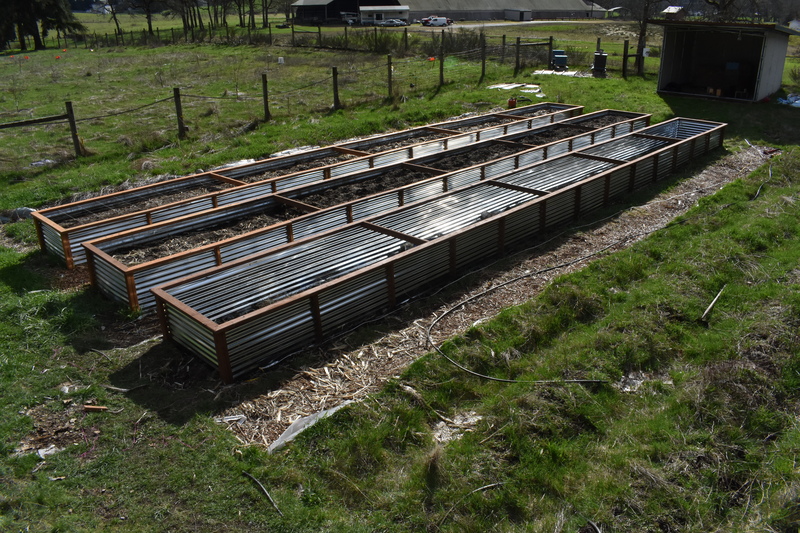 Here are a few pictures of my 50′ long raised bed garden boxes. Click to enlarge. Thank you for taking the time to read this post. Please, tune in next week to learn how to make my personally designed watering system. In the meantime, you can also check out the other posts I’ve written here.